Dr. Giovanni Andreotti has completed his first three months as a Clinical Mentor at Comfort Clinics. Giovanni was sponsored by Project Malawi Onlus and Azienda Sanitaria Locale (ASL) of La Spezia to come to Malawi for one year. During his first three months here, he has focused on mentoring our Clinical Officer in the Pediatric Ward, has implemented several World Health Organization guidelines, and has set up emergency drug kits. With our shortage of clinicians in Malawi, he has also been treating patients and has personally treated 1,387 patients and admitted 117 children to our pediatric ward. When Giovanni returns from Italy in mid-January, he will begin mentoring the Adult Out-Patient Medical Officer. Everyone at Comfort Clinics wishes Giovanni and his wife Manuela a wonderful holiday and we look forward to their return! 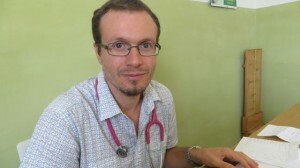 This entry was posted in News from Malawi and tagged Comfort Clinics, Dr Giovanni Andreotti, Project Malawi Onlus. Bookmark the permalink.